Because we all somehow seem to relate gray hair to aging, most mature folk prefer to hide their white locks, thinking that doing so will give them a more youthful appearance. Maybe this concept is true, but we must exclude the twenty-something pop-stars out there, today, who implore their colorists to go silver. Today, let’s talk about gray tones, and how mature women in 2016 are wearing them. Hoary-gray is a seasonal hue that colorists deem to be both adult and in-vogue. Young actress, Kori Hendrix, showed off some hoary-gray locks at this year’s Olympics in Rio; moreover, the mature Helen Mirren flaunted this same shade at the London’s National Theater earlier this year. This tells us that hoary-gray is definitely becoming a fad tone for women of all ages, which is a good heads up for those looking forward to next season’s trends. Salt-and-pepper hair shines in the daylight. Your name doesn’t have to be Jamie Lee Curtis for you to look incredible with showers of salt-and-pepper hues in the mane. The year 2016 presents a twist to this traditional shade by blending those random clusters of natural gray you own into a pop-pleasing darker shade. What your stylist will be shooting for are chic streaks with strategic highlights, which he or she can accomplish by lightening the off-strands to create ribbons of gorgeous silver and black locks. Purple gray locks are as attention-grabbing as platinum-blonde tresses, and there is no rule that says you can’t spice up your grey hair with a little modern color. Further, these locks will require some regular deep-conditioning treatments to add violet-shine and to help smooth out the whiter cuticles. One may also consider adding highlights or lowlights to purple-gray color for some extended volume and texture. White-silver is the answer that most clients seek, both young and old, when going for the all-gray look. That being said, even though this shade is most popular, it’s not for everyone. White-silver hair doesn’t always complement warm skin tones; hence, those with yellow or olive complexions beware. Also, this hue does not harmonize well with thinning locks, unless the cut is short (we never want to make superfine hair look thinner). Finally, frizzy tresses with flyaway strands will make gray appear even grayer, which is what we don’t want in 2016. Thus, if frizz control is a problem, you may want to consider a darker, sleeker shade for a fuller profile. For hair color in Oklahoma City with low ammonia and low fade, call me (Anastasia) for an appointment. 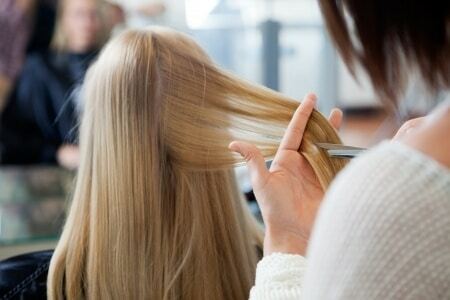 Anastasia is a salon hair stylist in Oklahoma City, OK. As a master stylist, she provides hair extensions, hair straightening, hair color, hair cuts, wedding updos, model and men's cuts, and lace wigs. Call now to book an appointment.